If you parent or teach girls or if you’re interested in understanding how women become successful, my new book will give you important insights. The Rimm Report investigated the childhoods of 1,236 successful women in a retrospective study. The criteria for the women’s inclusion in the study was that they were successful and happy in one of eight careers that have not been traditional for women or one of four traditional careers. If not for the women’s movement, it is unlikely these pioneer women would have entered their present non-traditional professions. The women also had to qualify as being reasonably happy in their relationships with family and friends. The findings of my book are used to offer advice to parents of girls on parenting their daughters for success. Some of the findings were very surprising, and others support what psychologists already know produces success. Some findings follow. Winning in competition was noted most frequently as a positive experience for these women. Winning was motivating and exhilarating. Advice: Encourage girls to enter a variety of competitions based on their strengths. Permit them to enjoy the exhilaration of winning while learning the resilience that accompanies losing. Be kind, but don’t overprotect them when they lose. Losing is an important learning experience. Travel was mentioned next in frequency as an important experience. The women described travel as encouraging family bonding, independence, and a spirit of adventure. Advice: Family travel is worth the hassle. The women seemed to remember the family squabbles, but the squabbles never interfered with their memories of positive travel experiences. Encourage schools to provide independent travel opportunities for teens. Working towards and earning expenses for school trips was beneficial and the trips were found to be enriching. Only 25 percent of the women considered themselves to be very social while 40 percent considered themselves as less social than typical. Many women considered themselves different, and it may be that the differences fostered the independence they particularly needed in some of their pioneering careers. Women in the following career groups reported the most sociability: media, government, education, business and homemaking. Least sociability took place in mental health, medicine, science, nursing, law, music and art. Advice: Don’t pressure your daughters about socializing. Respect their individual differ-ences, but be supportive if they’re lonely. Some of the women felt very lonely during adolescence; others simply regarded themselves as different or independent. Many dealt with wishing they were prettier, thinner, and more popular. Acne, weight, and peer pressure caused problems. They coped by involvement in interests; reading, music, writing, drama, debate, sports, Girl Scouting, or religious activities. Advice: Encourage your daughters to develop active interests. Girls build confidence by participating in extracurricular and other activities. These activities also provided positive escapes from pressures. 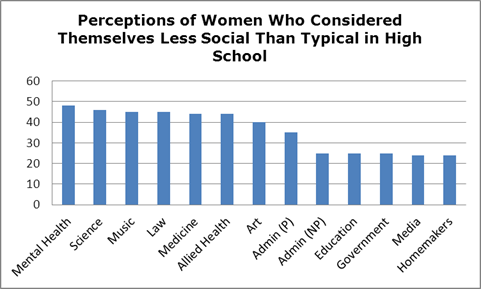 Most of the women were very good students; the average graduation rank was in the top 13 percent of the class. Although some experienced math, science, and general grade decline in middle and high school, most did not. Math was a strong subject for physi-cians, scientists, and business executives. It separated the doctors from the nurses and was not as strong for the women in law, government, media, mental health, homemaking, education, and the arts professions. Advice: Some girls need special encourage-ment and support during middle and high school when their interest in boys may tempt them from conscientious schoolwork. Tutoring to encourage math confidence, and all-girl classes or schools could open career doors for many women. Mathematics is a threshold subject for many high-level career opportunities. These were the words most frequently used by the women to characterize themselves. There were many “good little girls” and even those who described themselves as “shy,” “tomboys,” and “bookworms.” Shy girls learned to speak up. Very few characterized themselves as troublemakers or rebels. Advice: Cultivate intellectual confidence paired with a work ethic. Shy girls should be encouraged to speak up. If they’re having behavioral problems, get help. They may not automatically outgrow them. The successful women tended to befriend other achieving students or at least mixed groups of students. Very few indicated friendships with peers who opposed learning. Advice: Peers do make a difference. Try to steer your daughters away from negative peer groups. Involvement in positive interests and activities will assist them in staying positive. Winning in academic or community competition prevents their feeling like losers. Volunteerism helped them to feel good about themselves. In every career more of the women (about twice as many) identified with their mothers as their fathers. As they matured some changed identification from mothers to fathers. Quite a few, particularly in the arts and education, identified with their teachers. Teachers, professors, and employers were often important mentors for these women. Advice: Mothers, dads, teachers, and other relatives are more likely to be role models to girls if they lead active, interesting lives. Girls are influenced by the adults that surround them. Be a good role model. Find other family and friends that are good role models for your daughters. 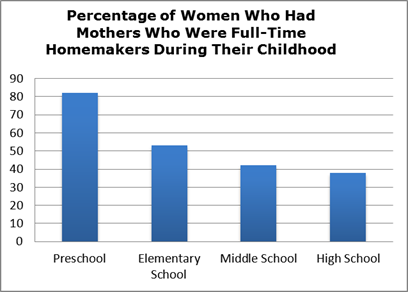 Although over 80 percent of these women's mothers were homemakers during their preschool years, by their daughters’ high school years, only one third remained homemakers. Many mothers went back to school while their daughters were growing up. The groups that had the highest percentage of mothers who returned to school during their daughters’ childhoods were the physicians (40 percent) and attorneys (28 percent). Many other mothers had careers. Advice: You don’t have to sacrifice your own future in an effort to be a good parent. Active successful parents were good role models for success. Successful women regarded their single mothers as inspirational for achievement and independence. However, several women described painful divorces by their parents as providing them with feelings of insecurity in regard to relationships with men. Advice: Your being a single mother does not limit your role as an effective role model for success. Don’t make your daughter a confidante about a negative relationship with her father or with other men, or you may cause her to feel distrustful of men. Most of the successful women believed that both their parents had high expectations of them. Many remembered feeling pressured but indicated that for the most part they didn't mind the pressure. Their memories of high expectations included the expectation that they be hard workers. Advice: If you pair your high expectations of your daughters with expectations of effort, they are less likely to believe they should be smart magically. Emphasize the satisfaction derived from accepting challenges. These women outperformed both their mothers and fathers in their educational success. Fewer than a third of their mothers and fewer than half of their fathers had completed college. Almost all of the women in the study had completed at least a bachelor’s degree. One third of the women had completed master’s degrees and another third had accomplished doctoral or professional degrees. Thirteen percent had at least one immigrant parent. Advice: Don’t view your own education as a limitation to what your daughter can achieve. Although women of all birth orders were involved in all careers, almost all careers had more oldest children, followed by middle and youngest. There were two exceptions. More homemakers were middle children, and more mental health professionals were youngest in the family. Advice: Be sure to rotate family responsi-bilities among your children so they all have opportunities for leadership. Don’t label your children as “scholar,” “athlete,” or “the social one,” or you may be limiting their self-confidence to the label you’ve assigned them. When the successful women compared themselves to their sisters, they tended to describe themselves as more assertive than their sisters, less neat, less attractive, more active, and more hardworking as a student. When they compared themselves to their brothers, they tended to describe themselves as working harder to prove themselves. Advice: Be sure your daughters and sons are given success messages about achievement. Don’t overprotect your daughters, and encourage all to be assertive. Other information about See Jane Win.